In order to understand how LASIK eye surgery is performed, you need to have an idea about the basic structure and function of your eyes. Only a basic overview of the anatomy and physiology of the visual system will be discussed. Before discussing the structure of the eye, give yourself a minute to look at your eyes in a mirror. Try to notice its structure and position in your face. Have you ever wondered about the structure of your eyes? or How this miraculous organ works? Now it is time to learn more about your eyes. Let’s take a tour in the eye, starting from the outside and work our way toward the back of the eye. The Eyelids are mostly composed of skin, muscles for movement and glands for secretion of oil into the tears to keep the tears from evaporating too quickly. The eyelids protect the eye from strong light, dust and foreign objects. Closure of the lids during sleep protects the surface of the eye from drying. Blinking the eyelids lubricate the eye. The Palpebral Fissure is the space between the upper and lower eyelids. The Eyebrows help to protect the eyes from dust and direct sun light. In addition, they prevent sweat from dripping in the eyes. The Eyelashes are short hairs arising from the eyelids margin and help protect the eye from sun light and dust. The eyelashes are more numerous in the upper lid than the lower. The Conjunctiva is a transparent thin membrane that covers the front of the eyeball and lines the inside of the eyelids. The conjunctiva is loose enough to allow the eye to move freely. It contains cells that liberate mucus into the tears, helping the tears to spreads evenly over the front surface of the eye. The Tears are produced by the lacrimal glands. The tears flow down the front of the eye and drain through small pores on the eyelids margin. Then tears flow down the lacrimal tubing and finally drain into the nose. The tears wash the eyes and carry foreign objects to the side of the eye. The Cornea is the clear crystal part of the front surface of the eye. In addition to protecting the delicate structures inside the eye, the cornea helps focus rays of light on the retina to create an image. Its working is similar to that of the lens of a camera, focusing rays of light to create an image on the film. As the cornea is the target part of the eye in LASIK eye surgery, we need to discuss a little more details about its structure and function: Further details about the cornea. The Sclera, the white of the eye, is the outer fibrous protective coat of the eye. It helps maintain the shape of the eye and receives attachments from the muscles, which move the eye. 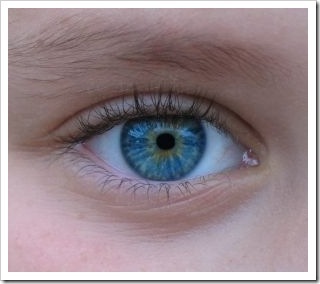 The Iris is colored part of the eye which lies behind the cornea and inside the eye. It is composed of muscles and contains pigments. The iris has a hole in its center called the pupil. The iris can change the size of the pupil, by its muscles, to control the amount of light entering the eye. The Lens is the flexible, transparent structure found behind the iris. It is held in place by ligaments called zonules. In order to see clearly objects at different distances, the lens has the ability to change its shape to focus images on the retina. This process is known as accommodation. Outer coat is fibrous, and is formed of the cornea and the sclera. Being tough and strong, this layer serves to maintain the shape of the eye and to protect the underlying delicate coats. Middle coat (uvea) contains blood vessels and pigments and divided into the iris, ciliary body, and the choroid, all are continuous with each and are together named the uvea. The function of this layer is to provide nutrition to the other coats. Inner coat (retina) is the sensory part of the eye and is formed of nervous tissue. The role of the retina is to sense light and transform it into electrochemical signals that the brain interprets as vision. 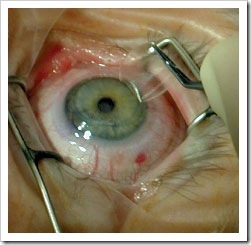 The anterior (front) chamber is the space between the cornea and the iris (the colored tissue at the front of the eye). The vitreous chamber is the space between the lens and the retina. Both the anterior and posterior chambers are filled with a clear fluid called the aqueous humor, which maintain the pressure inside the eye. The vitreous chamber is filled by a viscous, clear jelly (vitreous humor), which support and protect the lens and the retina. The Optic Nerve is a bundle of nerve fibers, which transmits the visual information from the retina to the brain. The Orbit is a pear shaped cavity in the scull; representing the bony housing of the eye. It provides the protection for the eye, mainly from trauma. The Eye Muscles: there are six muscles around each eyeball, working together to move the eye in all directions. These muscles are called the extra-ocular muscles and are attached to the bones of the orbit and to the surface of the sclera. Vision is a dual task performed by the eye and the brain. Our Eyes are the organs that detect light and form an image of objects on the retina. The image is transmitted along the optic nerve in the form of electrochemical signals to the visual and other specialized areas of the brain, where interpretation of what is seen takes place.